Through February 10, fans opening a Brewers Checking account will score more. 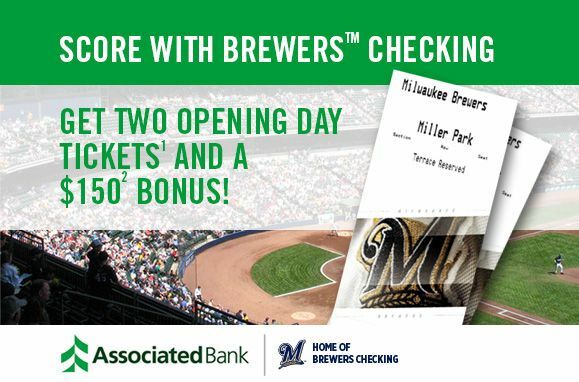 As part of Associated Bank’s continued partnership with the Milwaukee Brewers, fans have an opportunity to score coveted Opening Day tickets* as well as exclusive Brewers™ Checking account benefits. Running through February 10, new customers that open a Brewers Checking account will be eligible to receive two Terrace Level Brewers tickets* for Opening Day on April 2 against the Cardinals at Miller Park. This offer is only while supplies last, and is available at Associated Bank branches, online at AssociatedBank.com/OpeningDay, and at the Brewers On Deck event held at the Wisconsin Center on Sunday, January 28, from 10 a.m. to 5 p.m. The event requires tickets to enter. By opening a Brewers™ Checking account, fans can receive exclusive Miller Park benefits including a year-round 10% discount** at the Brewers Team Store by Majestic™, access to the Associated Bank Check In Gate and 2-for-1 ticket offers for select games. ** In addition, there’s an opportunity for fans to score up to $150***. For more information, visit AssociatedBank.com/OpeningDay. “Associated Bank is proud to share our excitement for Opening Day as it fast approaches and is offering fans an opportunity to score tickets that only cardholders can enjoy,” said Christopher Piotrowski, executive vice president and chief marketing officer, Associated Bank. For more information about Brewers Checking and other promotions visit AssociatedBank.com/Brewers. * Offer limited to new Brewers Checking accounts opened January 22, 2018 – February 10, 2018. Two (2) Terrace Level tickets to the Milwaukee Brewers game on April 2, 2018 will be mailed after the account is funded with $100. Please allow two-four weeks for fulfillment. Once tickets are in customer’s possession, Associated Bank is not responsible for lost or stolen tickets. Tickets are nontransferable and are not redeemable for cash. For tax reporting purposes, a 1099 may be issued at year-end for the year in which the tickets are given. **Show your Brewers card or checks when making a purchase or entering the Associated Bank Check In Gate. Exclusions may apply, please see a store associate for details. ***Offer limited to new Brewers Checking accounts opened January 22, 2018 – February 10, 2018. Minimum deposit required to open is $100. Deposits from existing accounts do not qualify. Customer must complete a minimum of three payments using online bill pay OR have one direct deposit of $300 or more to their account within 45 days of account opening. Bonus will be deposited into their account within 75 days of account opening after meeting the qualifications. Account must be open at the time the bonus is paid and must remain open for a minimum of 12 months. If the account is closed within 12 months, Associated Bank reserves the right to deduct the monetary bonus from the account prior to closing. Customers with an Associated Bank checking account in the last six months, joint owners on an existing Associated Bank checking account and Associated Bank colleagues are not eligible. Popmoney® and transfers to external accounts do not qualify for the required transactions to receive the monetary bonus. Exclusions apply. Primary owner on the account must be 18 years or older to qualify. Offer limited to one per household, cannot be combined with other offers and is subject to change (at Associated Bank’s discretion) at any time without notice. For tax reporting purposes, a 1099 may be issued at year-end for the year in which the bonus is given.